Early promises by Rizzo/Martinez on this 2019 team will be tested! 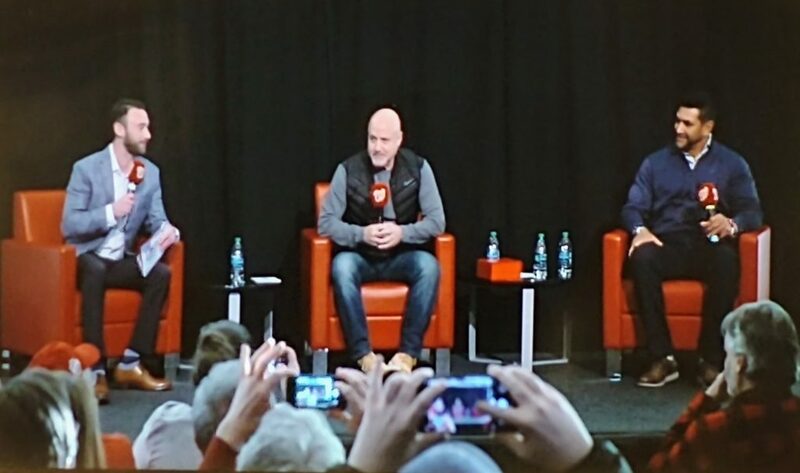 At the Nationals “Hot Stove” event prior to Spring Training, general manager Mike Rizzo and his manager Dave Martinez spoke to an invited list of season ticket holders. The pair laid out their state of the union team for the 2019 season. Call them campaign promises or just public relations, but there were some unified messages for them on what we would see from their 2019 term in office. “…We are going to play the best 9-players that are the best that day and may the best man win,” Mike Rizzo said. “…Like Mike said, the best 9-guys will play every day — most of the time — but you still have a job to do off of the bench,” Dave Martinez said. There is a reason that Rizzo and Martinez spoke about playing the best players, and it is because there is a history with this team that they ignore the analytics and play high-paid veterans over other players who could fit better in a particular game. It does not happen often, but the best example was during the 2017 NLDS, Dusty Baker started an aging Jayson Werth in each game — and it cost the team dearly and especially on defense. This “best player” promise will get tested on Opening Day and every game afterwards — but let’s face it, the term “best” is subjective. Madison Avenue uses that in advertisements all the time, and it is usually subject to interpretation if facts are not presented. However facts can be distorted by sample sizes so perceptions will vary. Should Spencer Kieboom be on the Opening Day roster because he has a lifetime .500 batting average against Jacob deGrom? Of course not. Since Jacob deGrom won the Cy Young Award last season, it took any guesswork out of the equation as to who the New York Mets would start on Opening Day. Jacob deGrom will face-off against Max Scherzer on Thursday on Opening Day, and the chart (above) indicates that maybe Kurt Suzuki, Anthony Rendon, Victor Robles, Ryan Zimmerman, and Wilmer Difo should all be sitting on the bench — but reality says you cannot sit everyone. Dave Martinez told us that Yan Gomes would be starting and Kurt Suzuki would be on the bench, but there is no replacement for Rendon and Robles. However, there is a replacement for Ryan Zimmerman where Matt Adams finished Spring Training en fuego homering in his last 3 games while Zimmerman batted .207 for Spring Training. Adams has hit deGrom better than Zimmerman, and Adams was rated as a better defender than Zimmerman last year. Adams was a 0.2 defensive player at first base compared to Zimmerman at a -3.7 according to Fangraphs ratings in 2018. With all the pomp and circumstance of Opening Day, Ryan Zimmerman, has started every Opening Day dating back to 2006. So we have a conundrum here. Do you go with the hot hand of Adams or stick with the Face of the Franchise? Could you argue the same for Wilmer Difo starting ahead of Brian Dozier? Difo finished the Spring at .265 while Dozier struggled at .182. 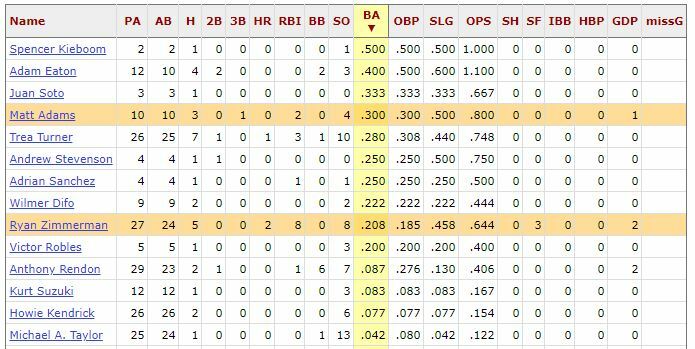 Some say Spring Training stats don’t matter, but Dozier batted the same .182 for the Dodgers last year when it did matter. Keep your eye on this for how much time Dozier will get to prove himself. If you want to show that you mean what you say and say what you do then do you break that “best player” promise on the first game of the season? Most expect Ryan Zimmerman to start and some will disregard the stats and question sample sizes and relevance and that starts the debate. Maybe it is not so cut and dry. This entry was posted in Analysis, DaveMartinez, Feature, MikeRizzo. Bookmark the permalink. Stephen Strasburg pitches the best game for the Nats in 2019; Zim/Dozier provide the offense!